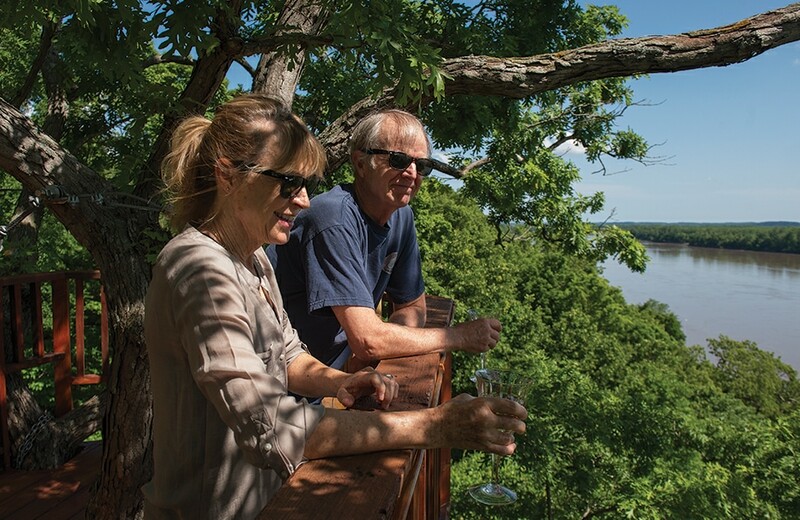 The swinging bridge and treehouse provide a breathtaking view of the Missouri River near Hartsburg, but the inspiration comes from rainforests and mountain stream crossings continents away. The two structures are Tim Travers’ retirement gift to himself and his wife, Ann, upon returning to their family home in southern Boone County after a dozen years working overseas. In 1998, Tim, then principal of Douglass High School, and Ann, a teacher in the Ashland public schools, decided to immerse themselves and their three children in another culture. Inspired by a Christmas-time conversation with a cousin who was living overseas, the couple attended a job fair. They snagged administration and teaching roles at the Taipei American School in Taiwan, moving there for two years with their three school-aged children. After that stint, they returned home, “but we’d caught the overseas bug,” and in 2004, they moved to Myanmar for seven years, then Lagos, Nigeria for three more, Tim says. All that time, they kept their southern Boone County house as a touchstone and gathering place during trips back to see family. Two years ago — with their own children graduated and moving on with their own travels and lives — the two decided to return to the home they’d moved to in January 1995 — finishing construction in a memorable 19-inch snowfall. Today, the interior offers an eclectic fusion of artifacts from extensive travels: chairs from Bali; rugs from Nepal and India; Buddha figures of varying styles; elephants carved from wood harvested after the 2008 cyclone that devastated Myanmar. A Burmese “Nat” spirit house on the patio offers protection to all within. Built by friend and Hartsburg neighbor George Zimny, of Zimny & Co. Building Construction, the house is a pastiche of inspirations: New Orleans courtyards and double-gallery architecture; a cozy touch of New England cottage, a “log-cabin-y, lodge” vibe in a massive stone hearth and beamed mantel — which a wall of windows and expansive treetop views of the Missouri River bring into pitch-perfect harmony. After graduating from the University of Missouri, Ann and Tim thought living in the country might be fun. They ended up finding a farmhouse in the area, later moving to a little house they rehabbed about a mile and a half away from where they now live. “We loved to hike — we’ve been on every inch of this area out here — and we discovered this land and fell in love with it,” Ann says. But the owners, elderly siblings, were not interested in selling. One day, about 10 years after their first inquiry, Ann and Tim found a handwritten note in the mailbox: “If you’re interested in the land, come by.” They laugh as they recall that Tim immediately raced over to make an offer but couldn’t get out of the Jeep because of the ornery dogs snapping at its bumper. Eventually, they purchased 60 acres of the land, so primitive that the river wasn’t visible through the dense foliage. They brought water, electricity and a road to the site they then subdivided into four lots, each with a river view. Their house is set back on a heavily wooded bluff overlooking the Katy Trail and Missouri River, roughly midway between Hartsburg and Cooper’s Landing and a stone’s throw from the tiny hamlet of Wilton. “He kept saying, ‘I’m going to build a treehouse; I’m going to build a treehouse.’ I didn’t believe him,” Ann says. “I guess you believe me now,” Tim teases back. He took his inspiration from “canopy walks” in Borneo’s rainforests and in Ghana, as well as from a trek through the Himalayas in northern Myanmar where the family traversed swinging bridges strung across rivers. Basic elements were similar — a densely wooded area with mature, tall trees that would provide solid anchors for a bridge strung over the ravine that separates the house and bluff from low-lying land next to the Katy Trail. A contractor with St. Louis Treehouse, who was an engineer, builder and climber, lived with the Travers for several days to design the project and put in place critical support cables and beams. Tim took about another month to finish building the decking, netting and railing on his own. 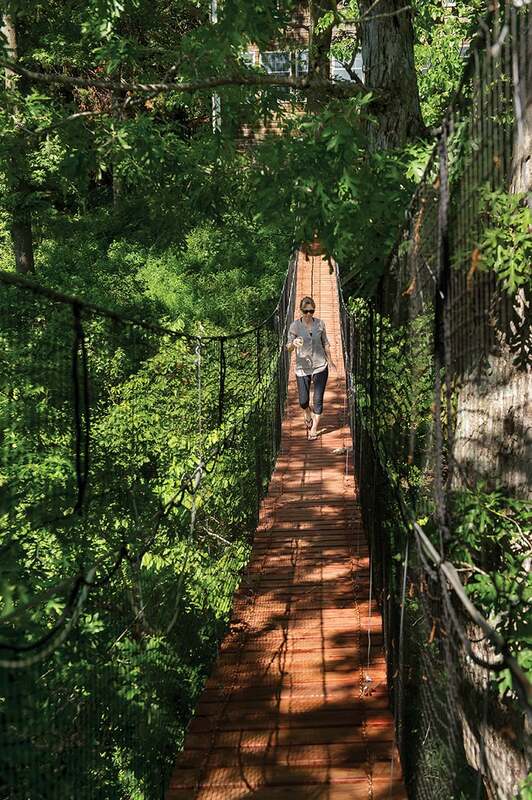 The simple suspension bridge is about 2 eet wide and 90 feet long — anchored on both ends to white oak trees. The oak that the treehouse is secured to, estimated to be about 150-years-old, towers 90 feet above the Katy Trail and river. The platform is built around one of its massive limbs, its dense canopy forming the “roof.” The railing is made with Cypress wood Tim reclaimed from a 50-year-old water tank. “Our habit is to sit out here in the evenings and watch the sun go down. We love to track it through the seasons,” Tim says. They look directly across at the Marion Bottoms Conservation Area, almost 3,000 acres of undeveloped land restored as wetlands after the 1993 floods. “We’ve seen some amazing sunsets and sights…the eagles on the ice floes in the river in winter, it’s just unbelievable,” Tim says. They have added a couple of stabilizing cables to the bridge, anchored in the ground, to keep the bridge from turning on its side in strong winds. “Storms occasionally will still break a slat or two that I have to repair, but it’s the retirement project that keeps on giving,” Tim says.